Spring is in the air. You’re probably out enjoying it already—walking the dog, visiting the park, putting out the porch furniture, and planting flowers. But don’t forget about mowing the lawn! It’s the time of year when the mower is dusted off and put back to work as the grass starts to grow. That means it’s also a great time of year to think about grasscycling your lawn clippings. When you grasscycle, you actually do less work. Instead of stopping to empty the bag on the mower, leave the clippings on your lawn and let nature do the rest. The clippings are small and will break down quickly. This gives your lawn food that it needs (nitrogen), as well as moisture. 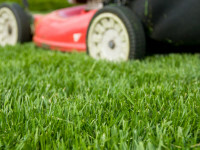 So not only is grasscycling easier on the person mowing, but it is also better for your lawn. That’s a win-win situation! It’s easy to grasscycle. All you need is the mower you already use. Simply remove the bagging attachment and, if needed, insert a safety device over the grass chute. If there isn’t a bag attached to your mower, you’re already set to grasscycle. Mow as usual, letting the grass fall back onto your lawn to do its good work!